Katarina Luketić takes on the far-fetched but enduring stereotype still hanging over the Balkans that it is a land of ancient tribal hatreds and inevitable conflict, in her book, The Balkan: From Geography to Fantasy (2013). Her sharp critique of the stigmatized view of the Balkans that still persists in the West is eye-opening. Luketić, born in Sarajevo in 1969, is an essayist and a journalist. She is the former editor of the well-known, independent cultural publication, Zarez. She co-founded the publishing house, Pelago, where she currently works as an editor. 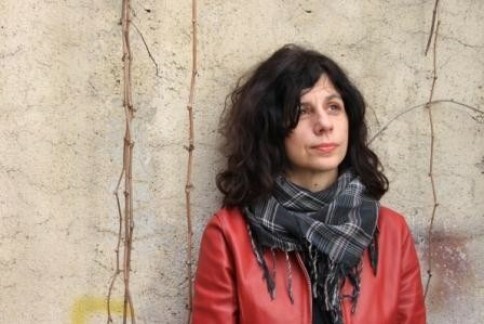 She is the recipient of the ‘Following the Traces of Totalitarian Heritage’ grant and is currently working on a new book entitled, Dealing with the Literary Past (Nationalism in Croatian Literature and Culture of the 1980s and 1990s). Read an excerpt from her first book, The Balkan: From Geography to Fantasy (2013), below. Translation by Una Krizmanić Ožegović. Over the last two centuries, the Balkan as a geographic term has become a strong metaphor; it is so semantically loaded that it cannot be used neutrally. Since the Ottoman Empire and especially after its fall, followed by the Balkan Wars, assassination in Sarajevo, World War I and the war in the 1990s, geopolitical meanings attributed to this area have been the breeding ground of negative stereotypes. Today, it is impossible to cut a path through the excrescence and come to a more or less healthy core, to the innocence of the word. When mentioning the Balkan, it immediately triggers wild imagination and geopolitical notions, whether it relates to current affairs or other, seemingly harmless discourse, be it literary, scientific or media. Even when the political reality is not spoken about directly, the Balkan and its baggage of metaphors, notions and imaginations is imprinted with political narratives, events and dominant power relations forged over the last two centuries. The Balkan is related to several groups of metaphors and notions. On the one hand, it is a space of restless borders and cultural clashes, the crossroads of worlds; historically, it is the intersection of major empires, religious schisms and imaginary cultural circles, written in indelible ink across the collective consciousness. On the flipside, that basic metaphor envisions the Balkan as a bridge, a link or a bypass between the East and the West, Europe and Asia, Christianity and Islam or Catholicism, Orthodox Christianity and Islam. The bridge is a positive metaphor only at first glance: it is a connection and a meeting point, but also a transitory place not worth getting to know better, because it only exists to be crossed. Also, the bridge has no real content, i.e., its content is exhausted by connecting/bringing closer together different and distant shores. As some kind of key piece of historical evidence of the essential savagery and violence of the Balkan, an attractive argument is often stated about how the 20th century began and ended with wars in the Balkan. The starting point of that interpretation of history is the year 1914, Sarajevo and the assassination of Franz Ferdinand, while the final act is the 1990s and the siege of that same city. The full circle of history of the 20th century is not only present in more “informal” media and literary discourse, but also in serious studies whose authors do not usually adhere to cyclical theories in the interpretation of European or world history, being more than willing to prove that history is always open-ended and unpredictable, with each historical moment being different and unrepeatable. The narrative of the Balkan as the bloody threshold of the 20th century forgets and ignores that European history is full of war and conflict, that all major European nations and civil revolutions were born out of bloodshed and that oppression, “territorial cleansing”, forced migration etc., went hand-in-hand with the creation of modern-day democratic societies. This is an attempt at interpreting European history in the spirit of the Enlightenment, as a constant progression towards democratic values and ideal civil societies. During that progression, wars and violence were sometimes necessary, and as such, they cannot smear the positive image of recent European history. The history of the Balkan, on the other hand, is given mythical treatment, as something doomed, as a vicious circle of horrors which men and women of the Balkans, due to their nature, i.e., “Balcanic blood and passion” can never escape. The Balkan, according to this interpretation, is consigned to a pre-Modern era in which categories of progress and development do not apply, it remains a space “outside history”, timeless and trapped in a barbaric and hostile vacuum. However, just as the schism and the bridge, these notions of the wild Balkan have their counterpoint. Sometimes, the wild Balkan meets a positive interpretation, local people are presented as “kind savages” who live in harmony with nature and imaginary primal, cosmic laws. This positive myth of the wild and exotic Balkan is actually a variation of the universal myth of returning to the natural state of the nation, to a prehistoric time untouched by civilization and modern inventions, not as morally corrupt as today’s modernized, technologically advanced and urban world allegedly is. Supporters of these anti-modernist interpretations, which are, in fact, exclusive and carry ethnic and nationalistic undertones, consider the Balkan as the last pristine, idyllic place in Europe, where the core values of Western civilization have remained intact. That Balkan is seen as an antipode to a certain kind of Europe, this time, a morally and politically corrupt Europe, a Europe which has forgotten its culture and betrayed humanistic principles. In this case, the Balkan is merely a distinction to establish a certain image about a subject, a mirror to reflect other identities. In short, whatever we want to see can be projected onto the Balkan, without registering what is actually there at a specific point in time. The discourse about the Balkan is characterized by essentialisms and imaginative notions which have been passed on, repeated and upgraded over time, regardless of real historical context. The discourses about the Balkan are, therefore, fixed and permanent, timeless and widely applicable, where often something which exists at a certain historical period is singled out and interpreted as something “natural” and “normal”, something that is present in every time period. Furthermore, the Balkan is constantly presented as a unique and homogeneous space, as a single body, single culture, single mentality, or as the same violence, same backwardness, same primitivism. Not only is the Balkan deprived of the right to grow, but it is also deprived of internal diversity, multiplicity, plurality, as well as overlapping with other geographical and cultural domains. When, however, the fact that the Balkan is not unified or unambiguous is pointed out, this often leads to the other extreme, stressing how overwhelmingly “complex” it is, even monstrously so.